Contest: WIN: a 23andMe Health + Ancestry DNA Test Kit. This contest has been marked as a duplicate of == Win a 23andMe Health + Ancestry DNA Test Kit ($299)! ==. WIN: a 23andMe Health + Ancestry DNA Test Kit. 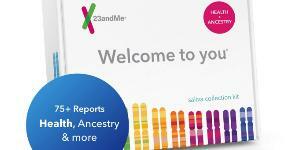 Prize: A 23andMe Health + Ancestry DNA Test Kit. Statistics: This contest was opened by 21 and entered by 3 ContestChest.com members. 14% of those who opened the contest, entered it.